Time: 3 hrs. 30 mins. Williams Peak is a backcountry ski trail just west of the Sunlight Mountain Resort Nordic Area near Glenwood Springs, Colorado. The trail begins off of Forest Road #300, aka Highway 117, where it makes a steep climb up the north side of Williams Peak (10, 079 feet). On weekends during the winter months the trail sees a steady stream of backcountry skiers trekking up to the summit all so that they can enjoy the downhill run through the trees that lasts for more than a mile. This post begins where the winter maintenance of Forest Road #300 ends. To get there follow the directions to the Sunlight Mountain Resort Ski Area which is about 10 miles from Glenwood Springs. Just before reaching the base area turn right onto FR #300 at the sign in this photo and head toward Four-Mile Park. 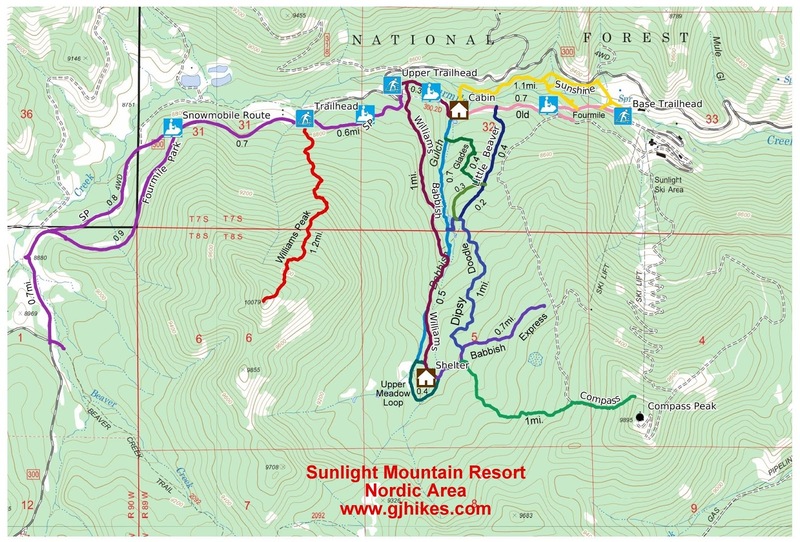 The upper trailhead for the Sunlight Mountain Resort Nordic Area is about 2 miles from the turnoff. Continue past the upper trailhead for another mile to where the winter maintenance ends. Most people drive all the way to the end where they can turn around and then park on the north side of the road facing back toward town. 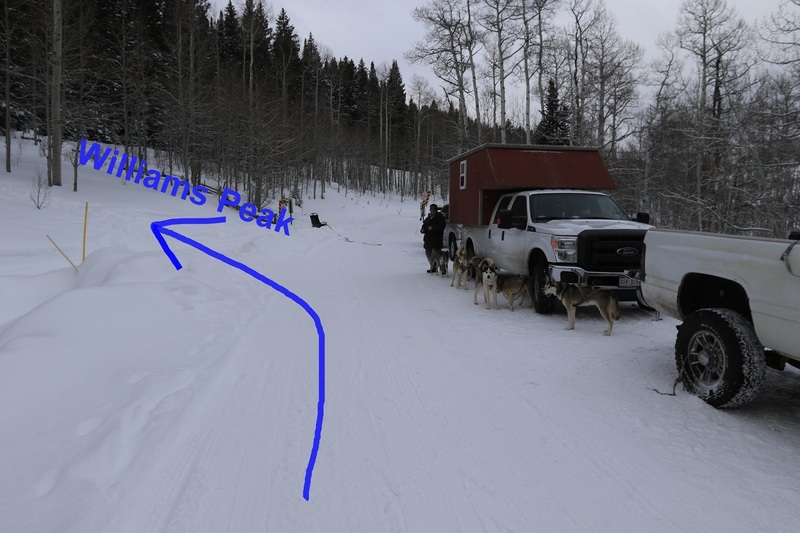 The Williams Peak trail begins on the south side of the road right before the 'No Parking Beyond this Point' signs. There isn't a trail sign where the Williams Peak trail begins but it is so well traveled that if you have a general idea of where to look you shouldn't have any trouble finding it. The entire trail is uphill from the time that it leaves the road until the point that it reaches the summit of Williams Peak. There are places where the trail actually gets pretty steep, especially considering the mode of travel. The trail can be a bit of a squeeze in a couple of places. It's interesting that a forest of aspen and conifer trees can serve up so much pleasant scenery that is continually changing with each turn in the trail. As the forest begins opening up the end is near. The trail comes all the way out into the open as it makes its final assault on the peak. Bare to the elements the wind has whipped up a cornice of snow around the leeward side of the peak. From the summit there is a commanding view of Fourmile Park to the west and the upper slopes of Sunlight Mountain Resort to the south and east. Tracks from backcountry skiers go off in several directions from the summit. There are apparently several popular downhill routes from the summit where the tracks go off in various directions. We don't have any information about any of those routes. On the day that we took the photos for this post we were on snowshoes and we came down the mountain via the same route that we went up. We saw around 50 other people and they were all backcountry skiing. We had encountered 16 people that consisted of 1 to 4 individuals in each party before coming upon a group of 25 people. Judging from that the Williams Peak trail is probably one of the most popular backcountry trails in the area. If you would like to see it for yourself then all you have to do is 'Take a hike'.